Home What's On Burley Christmas market in its 16th year! Burley Christmas market in its 16th year! 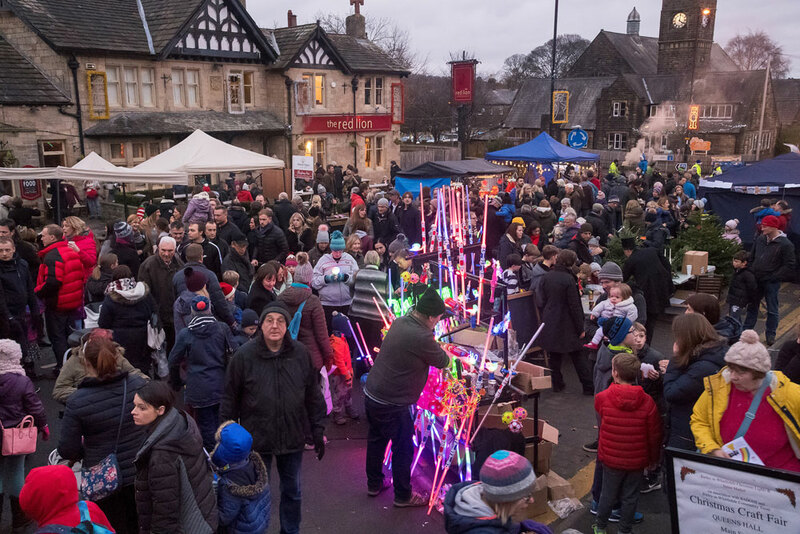 The community of Burley in Wharfedale, near Ilkley, West Yorkshire, has stepped up to make sure its popular Christmas Street Market continues alongside the village’s lights switch-on and indoor craft fair. The Burley in Wharfedale Community Trust (BWCT) has taken over the running of the successful market, which this year takes place on Saturday 1st December from 1pm to 5.30pm. BWCT will organise the event with the support of the chamber of trade, BADCOT, which ran it for 15 years. The Street Market will include Christmas trees, gifts, chestnuts, fine cheeses & salami, pancakes, hog roast, toasted sandwiches and lots of other food offerings, different kinds of drinks (mulled wine, other hot and cold), cards, clothes, light sabres – and of course, traction engines! Several great local charities will also be represented. Most importantly, Father Christmas will be outside Burley Grange, along with several rides. Please note Main Street will be closed from 12 noon until 6pm with a diversion into Grange Road. The Craft Fair in its 5th year includes the launch of the Burley Painting by Ian Middleton and many stalls with jams & chutneys, local photographs and paintings, Christmas wreaths, knitted, sewn, wooden and Fairtrade gifts, candles, jewellery, cushions and bags, and even recyclable beeswax food wraps – plus tombola. Perfect for Christmas shopping! The Community Trust leads on the Christmas lights (with funding assistance from Burley Parish Council) and it will be as magnificent as always! This follows on from the two new light displays acquired by the Trust for Remembrance Day and attached to the front of the Grange by the war memorial. Volunteers have been out putting up the lights since the end of October. It’s a huge task involving lots of people, ably led by Tom Sumner. He remembers that: ‘The lights started 37 years ago with a simple string of lights and now has grown to the fantastic display we have today. The volunteers come out for six weekends before the switch-on and work in all weathers but this year we have been blessed with good weather so far.’ The lights switching-on will be preceded by musical contributions and an address from Rev Jason McCullagh from the Salem Church. The details of a guest celebrity are still to be revealed. Alongside all of this will be a display of illuminated nativity scenes plus refreshments in the Methodist Church, more nativity scenes and refreshments in the Salem Church, tea and cakes in the Round House supplied by the Wharfedale Scone Roses, and an after lights party at the Cricket Club. Thanks are also due to Jan Lepley for organising the street market, Nick Turnbull for his work on the craft fair, Mike Parker for traffic management control, Alan Hayes and the Red Lion team, Danny Schofield and the BADCOT team who have done so much over many years, and Rob Pawson. Thank you to the Parish Council for help with funding. And don’t forget that the local pubs, restaurants and shops will be open as well. Bucket collectors will be out and about and there are collecting tins in most local outlets – please give generously to ensure this annual event continues every year!